I decided to join a couple of 'baking' blogger groups, Tuesday's with Dorie and Daring Bakers. Unfortunately I chose the absolute worst time as far as assessment at uni goes and am struggling to keep to the guideline of baking at least once every two weeks with the Dorie group and was too busy to attempt the Opera Cake for this month's Daring Bakers (I would love to make it though, I have always wanted to give it a go!). I joined both groups to extend my horizons and try doing something new, and also as it is great to see so many people make the same thing at once (and how many variations can exist!). 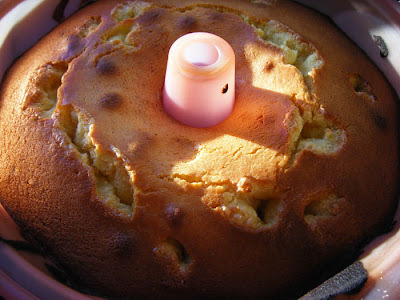 This recipe is the first recipe set when I joined TWD, a Ricotta, Honey and Fig Polenta Cake. 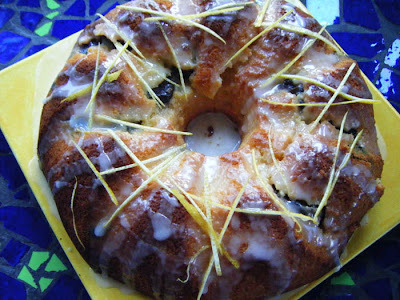 The sound of it really captivated me, I have been wanting to make a polenta based cake for ages. I decided not to use figs though and instead used prunes, which I soaked first in some orange juice to plump them up. They worked wonderfully and I would definitely use them again. I also made it in one of my silicone ring tins instead of a fluted tin, which I would also do again as it worked out well. 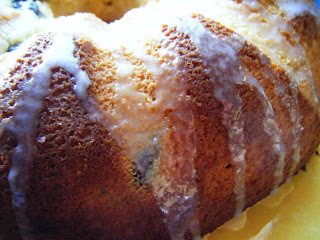 I drizzled it with a lemon glaze (lemon juice and icing sugar). I am going to try and do some catching up on the prescribed recipes in a few weeks when university is over for about a month, I really do like the idea of baking along with others. 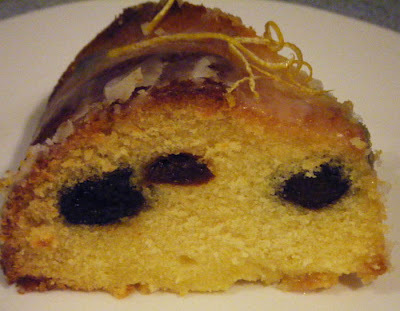 If you would like the recipe you can find it here I am looking forward to making this one again. Your cake looks beautiful and unique! Glad you've joined us! Linda your cakes always look fantastic! I love reading the posts on blogs from the baking groups, but it's just finding the time isnt it. Hope you find lots of 'baking time' soon. This looks really good Linda and I can't wait to try it! Linda your cake looks wonderful as do all your cakes! !